Two delightful speakers graced the podium at the 2018 St. David’s Day luncheon of the Welsh Society of Western New England. Professor Margaret Lloyd of Springfield College presented a fascinating introduction to the Mabinogi Tales of medieval Wales, telling of the mythical woman Rhiannon who travels from the Otherworld on a white horse in search of her prince Pwyll. She finds him and they are married, but after their child is abducted, Rhiannon heroically accepts punishment herself to spare the lives of her midwives. Professor Lloyd reflects on Rhiannon as a noble woman of stature and strength in her beautiful series of poems recently published in Wales. Her passionate readings of several excerpts enthralled the audience, bringing alive the power, pathos, and relevance of these oldest of Welsh myths. Travelling on My Own Errands - Voices of Women from the Mabinogi, Gwasg Carreg Gwalch, Llanwrst, March 2017. WSWNE President Susan Davies Sit, with our Welsh map of members' Welsh roots. Host for the annual luncheon, held this year on Saturday, March 3rd, was the lovely Nutmeg Restaurant in East Windsor, Connecticut, with about 40 in attendance. Society president Susan Davies Sit opened the meeting with greetings from other Welsh societies from around North America, reviewed the many activities of the past year, and introduced new members. The society is growing, enthusiasm is high, and the Welsh in the area are in good company. Come join us! On March 3, 2018, the Welsh Society of Western New England hosted its Annual St. David’s Day Luncheon event at which two delightful speakers graced the podium in the afternoon. Each has her own video. In this video, Helen Coates of the Copper Kettle Bakery describes her journey from LLantwit Major in the Vale of Glamorgan, watching her mum make Welsh Cakes, to Westwood, Massachusetts, where her dream of a bakery took shape. 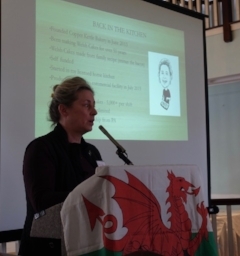 She began some years ago baking Welsh Cakes in her home kitchen, delivering daily to local stores, and now has commercial production with online sales and distribution worldwide. Her website, http://www.copperkettlebakery.com, not only sells her Welsh Cakes, but also her Welsh Cake mixes, preserves, and coffees. Plus it includes almost everything you could possibly want to know about Welsh Cakes. In this video, Professor Margaret Lloyd of Springfield College presents a fascinating introduction to the Mabinogi Tales of medieval Wales, telling of the mythical woman Rhiannon who travels from the Otherworld on a white horse in search of her prince Pwyll. She finds him and they are married, but after their child is abducted, Rhiannon heroically accepts punishment herself to spare the lives of her midwives. Professor Lloyd reflects on Rhiannon as a noble woman of stature and strength in her fourth collection of original poetry titled: Travelling on My Own Errands – Voices of Women from the Mabinogi, Gwasg Carreg Gwalch, Llanwrst, March 2017.